Serve your customers a taste of the shore, delivering rich seafood flavor in a creamy and satisfying soup. 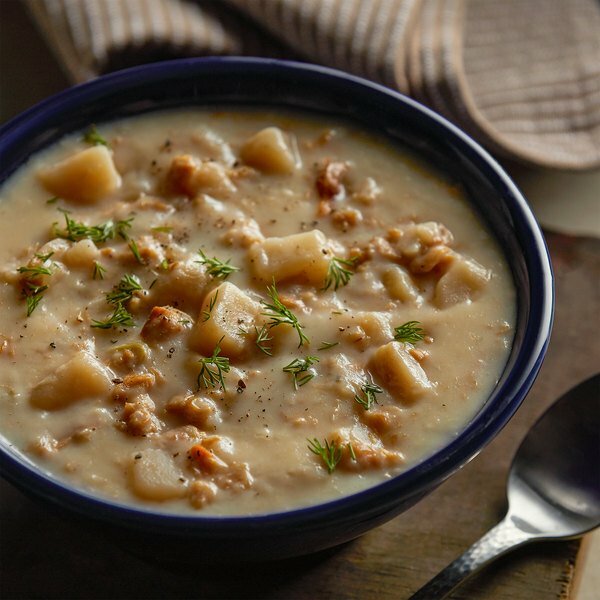 Combining fresh, succulent sea clams and bursting with garden-fresh potatoes, onions, celery, Grade A butter, and savory spices, this Chincoteague condensed New England clam chowder offers a traditional, wholesome medley of full bodied flavor that's sure to please. Since 1955, Chincoteague's family-owned business has featured canned options for top quality seafood and fresh ingredients with gourmet flavor. Offering a homemade taste, Chincoteague soups have no preservatives, artificial colors or flavors! This soup is easy to prepare, lessening prep time and strengthening good service, and its hearty consistency makes it a welcome addition to your menu. The savory and velvety taste of New England clam chowder makes for a flavorful entree or appetizer. Serve with salty crackers, pair with fresh seafood offerings, or use in other gourmet creations! Empty contents into a saucepan. Add an equal amount of milk to each can. Heat slowly, stirring often until evenly blended. DO NOT BOIL. Great clam chowder, i add onions and some pepper and make it better with some add ins, besides that, high quality ingredients and packed with clams. Perfect for serving large numbers of servings that are thick, flavorful, and loaded with clams. Love it just as is but it's nice to sometimes serve with sliced lemon, or sprinkle with oregano or Italian spice. This product really surprised me in the taste range it ranks right there with the big brand names. I have purchased again and the customers enjoy it. I worked in restaurants for years and never could get the same clam chowder at home. I love this stuff! I'm so glad that I found a supply and can eat my favorite soup at home anytime I want. 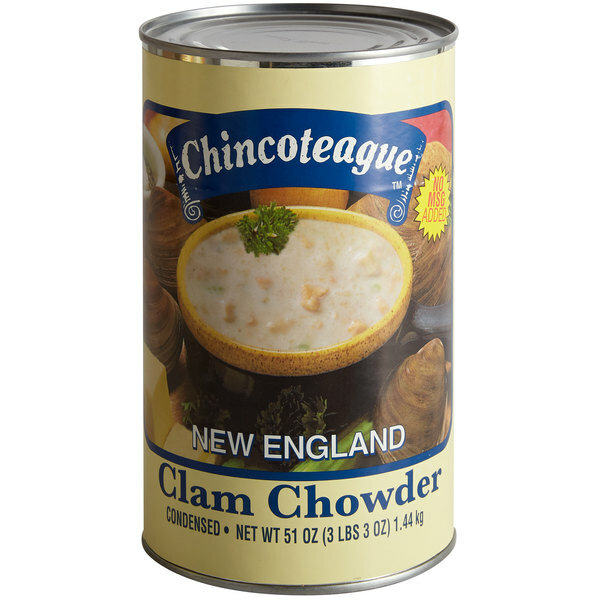 The Chincoteague condensed New England clam chowder is very authentic to the region and tastes great. A great soup special for our sweets shop and deli. Definitely tastes like a high quality clam chowder. There is a good amount of clams and some very soft potato chunks. It is not heavily seasoned, so you may add some more according to your preferences. I like mine with oregano. You can also substitute half the milk for clam juice to have a more distinct clam flavor. Overal highly recommend. It is not very creamy but you can adjust it with cream. The New England clam chowder is terrific and tastes so yummy. The soup is creamy and well seasoned. A quick, delicious soup to cook our family. A nice and creamy style condensed New England clam chowder that is bold and flavorful. Just add water and you have a hearty soup in minutes. A great tasting New England clam chowder that is creamy and rich. It is some of the best I have had and it is so easy to prepare. We really enjoyed the Chincoteague clam chowder. The soup was rich and creamy, and it was packed full of flavor. It warmed up quick and easy and made a great soup choice for our sub shop. The single can is great if you want to try it out, but you will want to buy it by the case after the first bite! This is a good canned version of New England clam chowder soup. It is good to keep a few on these in the pantry. They make fast and easy but tasty meals. THIS WAS GREAT STRAIGHT OUT OF THE CAN THE ONLY THING I ADDED WAS A LITTLE REAL BUTTER AND SOME CHOPPED CHIVES. GREAT TASTY PRODUCT.